Good To Begin Well, Better To End Well: March Roars aka SECRET THINGS! Forged by Fate's cover art got 3 thumbs up from All Things Urban Fantasy on Wednesday! And it is coming out on Tuesday. TUESDAY! Ahhhhhhhhhh!!!!!!!!!!! Yeah, I'm a little bit excited. In fact, I'm so excited about this coming Tuesday that I am posting on Monday with some exciting awesome THINGS which hopefully will make up for the fact that I am not posting properly this month. But wait, I hear you saying, this photo is familiar. Didn't you ALREADY post a picture of yourself signing things? Yes. Yes, I did. 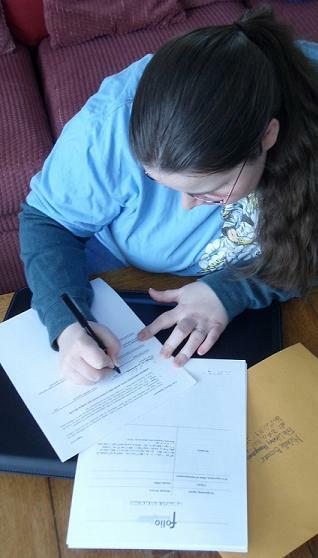 When I signed my contract for Forged by Fate, I did indeed immortalize it in the digital world with a picture. So what on earth could I possibly be signing now?! Well, there are two important points to this photograph which I'd like to emphasize now. With more photography. Yes, that is Zeus on my shirt, pitching lightning bolts from the clouds after deflecting a fish with his forehead. This may or may not be a clue as to which of my manuscripts was the impetus of this immortalized moment. Yes, that does say Folio Literary Management. And Retainer Agreement. And Michelle Brower. 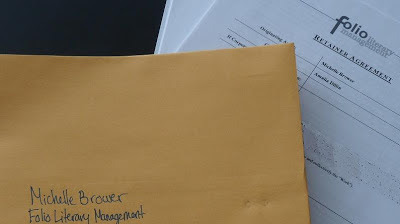 And yes, yes I did sign with an agent! A wonderfully enthusiastic agent, in fact, who makes free with exclamation points the way I had always hoped one would! This is just the beginning of the story -- and I promise you, there will be a full accounting of "how I got my agent" so definitely check back after Forged by Fate's release for all the details! For now, let me point you to a few new places where you will find me (and I hope you'll follow me! ), because I'm embarking on a publication quest in a new genre with Michelle, and that means I get to be TWO authors moving forward. So, Friends and Followers, meet Amalia Carosella, my alter ego, who will be pursuing a traditional publishing career writing historical fiction! You'll find us on Twitter, Facebook, and over yonder at www.amaliacarosella.com. Monday!!! Be here or Be Square!! *This may or may not be another clue as to which manuscript finally catapulted me out of the trenches of the Query Wars. Really, that can't be said enough. I KNOW this excitement is only just beginning of things for you! Soon we will be fighting in the NEW trenches together! Congrats! Such great news and very exciting. Cant wait for Monday. And I love Norse Gods and Greek Gods so cant wait for Monday! AH! Congrats! Girl! Every time I turn around and sign online you have some exciting news! So happy for you! Yahoo! I am so beyond excited for you! Years of hard work are finally paying off--I sure hope you and the husband are celebrating like crazy! hahahaha. I KNOW. 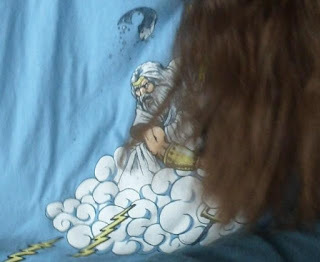 Zeus really makes all the difference. You are on fire! CONGRATULATIONS!!! !